These days, more than ever before, savvy homeowners have discovered that renovating their house is an exciting way to get a new, upgraded home – without changing their address. Especially when it comes to resale values, experts say updating a kitchen or bathroom could be the best money you ever spend on your place. Homeowners and husband and wife team, Hal Eilersen and Nancy Woods, have lived in their Granite Bay home 15 years and love the natural setting of their property. “The house is located on a really pretty piece of land, with lots of oaks and granite and redwoods around,” says Eilersen. But, he says, the home’s original construction didn’t take advantage of those beautiful views. 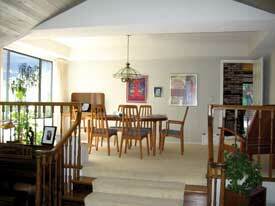 In fact, he says, the view to the outside was mostly blocked from the kitchen, dining room and living room. From an aesthetic standpoint, the Eilersen/Woods home needed updating as well. The kitchen counters and backsplash were covered in small white tile, and the cabinets were a dark wood. Without much natural lighting, the living space felt small and dark. Yet Eilersen says the decision to remodel their home in spring 2008, wasn’t just as much about fashion as it was about function. “My wife and I are vegetarians, so the cooking that we do takes a lot of time,” he says. “The kitchen wasn’t laid out very well for two people to cook at the same time. We were always bumping into each other and fighting over who got the sink,” he laughs. Enter Kent Eberle, owner of Eberle Remodeling in Sacramento. Since 1985, Eberle’s firm has handled strictly residential remodeling, which after 25 years in the business, includes mostly repeat customers and referrals. Once a physical education teacher by trait, Eberle says remodeling a home is a lot like following a lesson plan. “It really boils down to details, you have to get from point A to point B and the more you can spell out, the better you’ll be,” he says. In addition to structurally opening up the living space, the remodel included upgrades to the kitchen, living room, dining room, entryway and guest bath. Along the way, custom details personalized the project. 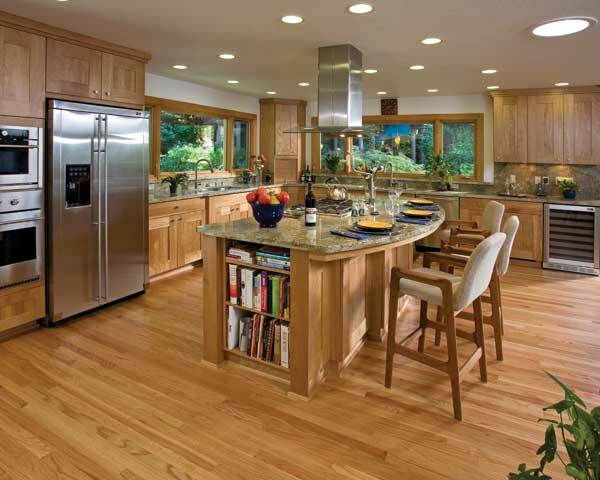 The kitchen cabinets were made of red birch with a unique wider-than-normal frame and Durango-style doors. The extensive granite countertops were a feature Eilersen says took forever to pick out. “We went to every granite shop in the area to find one we liked and there was enough of for the job.” In finishing the kitchen, stainless steel fixtures were added. As part of the remodel project, new wood flooring was extended from the kitchen into the family room, the entryway was tiled and a hand railing from family room to living room was redone. Another special touch for the cooking couple was the addition of two full size sinks in the kitchen versus the typical main sink and prep sink.